If it is true that Liguria is famous for its pesto sauce, caciucco style fish stew (ciuppin) and its Focaccia, for its superb olive oil and olives like the “taggiasca” type. Alongside these recipes, we have also the territory as Cinque Terre, the elegant seaside towns of Portoﬁno, Rapallo and Santa Margherita Ligure. But also it deserve a visit the inland areas, with its medieval villages from the top of the hills full of tradition and of course of delicious food! 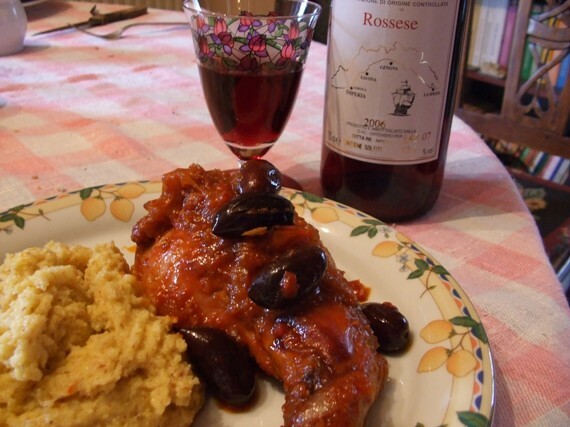 The Ligurian cuisine has also a fab star called coniglio alla ligure (rabbit ligurian style). First you should chop the rabbit into pieces. In the while heat the olive oil in a large pan and throw in it some chopped carrot, onion and celery. Cook all gently until the onion looks soft and transparent. Add the rabbit and cook over a medium heat. The rabbit will become browned on all sides. Put inside the pan the crushed nuts, the garlic, 1 bay leaf, the anchovy, the capers and the olives, while season with salt and pepper. Pour in the white wine and stir until most of wine has gone. Add enough stock sufficient to cover the rabbit, then cover up and cook over a lower heat for ca. 40-50 minutes, until the sauce has thickened and the rabbit is completely cooked. Add the chopped thyme and serve with a bit of polenta. This entry was posted on Thursday, March 1st, 2012 at 12:10 am	and is filed under Italian Recipes and Food. You can follow any responses to this entry through the RSS 2.0 feed. You can leave a response, or trackback from your own site.